Height – you don’t want a space where you constantly hit your head against the rafters, so make sure you have at least 7 feet of headroom. Look into adding dormers or gables to add needed space and don’t forget to check into city building codes for any height restrictions in your area. Weight – a contractor will be better able to assess the situation but you want to make sure the lower floors and foundation can support any additional weight created by adding dormers, gable, etc. Structure – remember your new floor was once the ceiling below so it may need to be reinforced before you start laying a new floor and adding walls on top of it. Check with your contractor on ways to balance the existing structure with the new added elements. Insulation – most likely your current attic is not insulated, nor does the framing give enough depth to hold rolled insulation. The contractor might need to re-frame the beams completely, or add larger beams to what is currently there. Clearances – when you are thinking about what will fit into your new space, like windows and doors, don’t forget to include measurements for framing and trim. A common mistake is to push everything as high as it will go, but forget about fitting in the basic trim around a door. 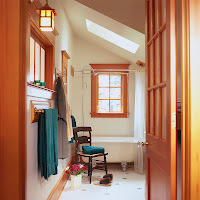 An attic renovation at first glance might seem like an easy task. But trust me, there is a lot more to think about then just putting up some walls. You want to make the space usable and hassle free. Don’t be afraid to add a dormer or new gable. It will cost more but the over all appearance inside will add real value to your home. Really think about how the bathroom plan will function. If you do it the wrong way, it might decrease value in your home when it comes time to sell. What ever you do, the best advice is to ask a designer to walk through the area with you and get some ideas. An in-house consultation usually costs very little, but can do a world of good!